On the ground in Africa, the activities of PACAW, Inc. are run by an all-volunteer staff. The staff personnel are members of the local committee that oversees all aspects of PACAW, Inc. programs in the community. At our present location, the local committee consists of eight members including retired school teachers and a representative of the Palace (Royal Chief) of the village. The chair of the committee is in frequent contact with the coordinator of PACAW, Inc. activities in the state. The coordinator is a member of the Board. This model has worked very well for us. The community leaders take an active role in making sure that the funds for our programs are spent wisely and that the infrastructure and equipments we provide in the schools are well taken care of. We plan to use this model at our other sites as we proceed with this endeavour in other locations nationally and internationally within Africa. This, of course is totally dependent on availability of funds. Members of the Organizing Committee for PACAW, Inc. projects in the Primary and Secondary schools at Koro-Ekiti, Kwara State, Nigeria. Mrs. Dupe Igunnu, Board Member and Coordinator of PACAW, Inc. projects in Kwara and Kogi States is 3rd from Right. 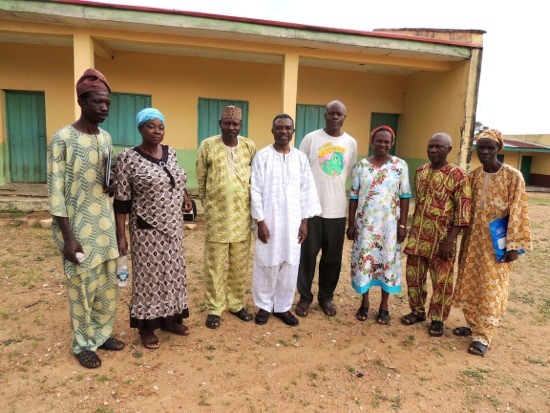 Mr. Ayodele Ajewole, Chairman of the local Organizing Committee is 4th from Right. Dr. S. Adetokunboh Ayeni, President, PACAW, Inc. is 5th from Right. Picture was taken during the First Annual PACAW, Inc. Leadership Academy in September 2014 in Kwara State, Nigeria.